Do you have excess heat that you can’t use? Sell it to us! As a supplier to Open District Heating, you recycle your excess heat to the district heating network and contribute to heating Stockholm households. Our offering is best suited for data centers, supermarkets and other industrial businesses that generate excess heat. As an Open District Heating supplier, you transform your cooling costs into a revenue stream by selling your excess heat to Stockholm Exergi at market prices. At the same time, we help to derive benefit from heat that would otherwise be lost. Recovering excess heat through Open District Heating promotes more efficient use of heating and cooling plants as part of the city’s energy system. Our aim is to always achieve mutual profit for suppliers and Stockholm Exergi. By 2030, 100 percent of Stockholm’s district heating is to be generated from renewable and recovered energy. As an Open District Heating supplier, you will also contribute to improved resource use efficiency and reduced climate impact. 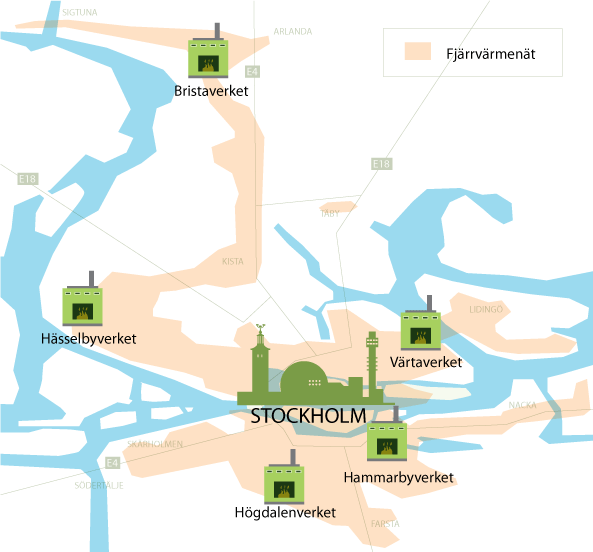 Stockholm Exergi’s district heating network consists of some 2,800 km of pipes under the streets of Stockholm. Furthermore, we have a world-unique district cooling network consisting of around 300 km of pipes. These distribution systems make it possible to transfer energy from locations with excess energy to locations where energy is needed. With Open District Heating, companies and businesses with excess heat located adjacent to our network can sell energy to us. Stockholm Exergi currently supplies some 90 percent of greater Stockholm’s district heating. 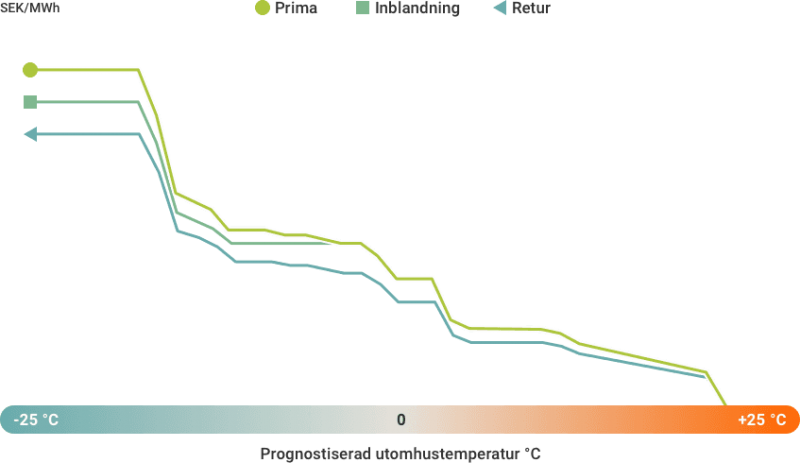 Stockholm Exergi pays for delivered heat capacity based on what the equivalent heat would have cost to produce in our plants. Payments are dependent upon ambient outdoor temperatures. For example, Stockholm Exergi pays MSEK 1.5 annually for heat deliveries of 1MW. Our payment model is split into two geographical areas: North and South Stockholm, and two different contract models to suit suppliers’ different circumstances and requirements. With ODH Call, suppliers and Stockholm Exergi agree on what levels of capacity are to be supplied to the district heating network. Stockholm Exergi call for heat when there is demand in the network with a guarantee to the supplier that such requests are always made when the outdoor temperature is 12°C or below. Suppliers’ payments are made up of two components: a fixed monthly payment for capacity delivered, and a variable energy payment for delivered heat. The delivery temperature to the district heating network’s flow line is typically 68°C, but can be higher in certain cases. ODH Call is suitable for data centers and other businesses that have stable levels of excess heat throughout the day and year. With ODH Spot, suppliers decide when to supply heat based on their own circumstances, and no specific capacity demands are made. Suppliers receive energy payments for the amount of heat they supply. Payments are based on outdoor temperatures and increase as outdoor temperatures decrease. ODH Spot is appropriate for businesses with variable levels of excess heat. Deliveries to the district heating network can be made in three different ways, all of which have different demands in terms of delivery temperatures and payment levels. Deliveries are made to the district heating network’s flow line and delivery temperatures are based on the temperature that Stockholm Exergi guarantees its district heating customers. Throughout the year’s ambient temperatures, the required delivery temperature can vary between 68°C and 103°C. Deliveries are made to the district heating network’s flow line at a temperature of 68°C throughout the year. Deliveries are made to the district heating network’s return line and delivery temperatures are at least 3°C higher than incoming return temperatures.